Catholic Education has been a part of our community since 1946! 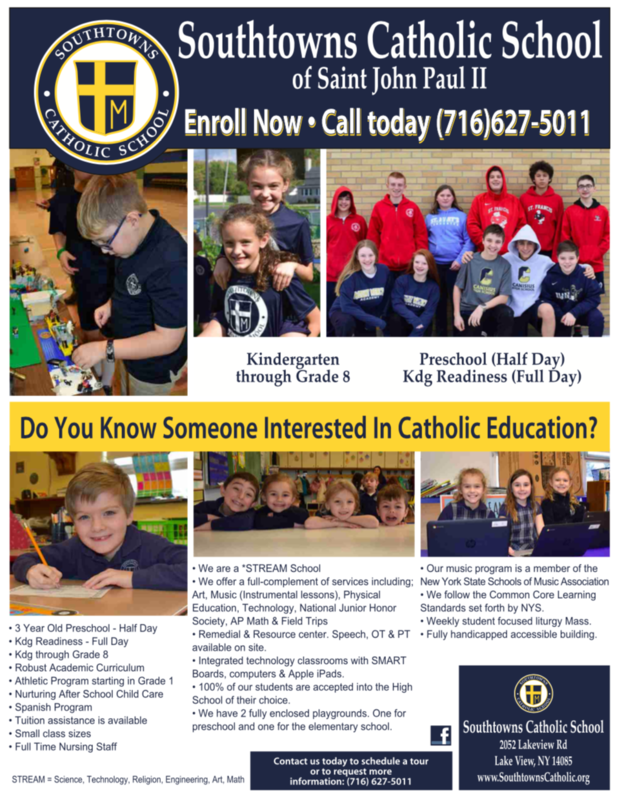 Do you know someone who is considering Catholic Education? Families interested in Southtowns Catholic School may be eligible to receive tuition assistance from the BISON Children's Scholarship Fund. The BISON Fund is a privately funded tuition assistance program for economically eligible families with children entering grades K to 8. 4/3 - We are almost 1/2 way!!! ​As of today, we are at $475! Please continue to bring in your cans & bottles for our Water Bottle Filling Station Fundraiser. School resumes on Monday, April 29. Congratulations to all of the students that participated in our Pennies for Patients campaign. It was wonderful to see our school community come together and raise $1326.83! SCS students had a friendly competition between grade levels. The winning team consisted of kindergarten, first grade and second grade. They will enjoy a Breakfast of Champions, dress down day, and extra recess time. Again, thank you to everyone that participated. The National Junior Honor Society of Southtowns Catholic is once again sponsoring the Pennies for Patients service project. This service project helps raise funds for The Leukemia & Lymphoma Society (LLS), the world’s largest non-profit health organization dedicated to finding cures for blood cancers. The Pennies for Patients program gave out $1.7 million dollars in copay assistance to patients in Western New York, and recently funded $500,000 in research at Roswell Park Comprehensive Cancer Center. Our campaign will begin on Wednesday, March 27 and continue until Monday, April 15, 2019. Students will be bringing home their collection boxes today. When it is full, send it back to school to be counted. Information went home today. Please join us on Wednesday mornings during Lent to pray the Rosary and share some breakfast treats. Prayer first, breakfast after…bring your Rosary! ***If you’d like to bring in a breakfast treat to share, let Mrs. Manley know. Your contributions are very much appreciated! ​ Hello, my name is Terry Walkowski. I teach art, Kindergarten readiness through eighth grade. This fall I began team teaching Pre-K 3 two mornings a week. Their eager, smiling little faces make me realize there is hope for a bright tomorrow. I received my BS degree in Art Education and my MS in Art Therapy. I am currently a Registered Art Therapist. I feel fortunate to have been a part of the faith filled community that is Southtowns Catholic School and Saint John Paul II Parish for 15 years. Having attended Catholic Schools myself grade 1 through 12, I have the honor of bringing that faith and knowledge into my classroom. I am passionate about the visual arts and it is my intent to facilitate each student’s success to their highest level. The creative problem solving that takes place in an art lesson generalizes into preparation for real life experiences. Mastery of techniques and media are explored in a developmentally appropriate progression, with an art history component. I am contracted by The Town of Hamburg’s Youth, Recreation and Senior Services to teach adult acrylic painting classes and run a Saturday art component for children/young adults on the Autism spectrum. My hope is that all the various individuals I teach and have contact with have their life enriched by their art experiences. Please keep in mind our Dress Code. Sneakers should be White, Gray, Navy or Black based sneakers. No bright colors, Sparkles or Light Up Sneakers please. Open to students of all faiths and cultures, a Catholic education prepares your child for all of life’s tests. Catholic school students receive superior academic instruction infused with Christian values. Academically, our students benefit from small class sizes and experienced, caring faculty. Tuition assistance is available, and students may receive free bussing. As a STREAM school, SCS endeavors to provide relevant learning experiences for our students. Through our Career Exploration, parents are invited to speak to students about their careers, exposing students to the real world applications of their learning. Your experiences inspire student achievement. Career Exploration links students' interests and potential career paths. A handy student may realize she would make a great engineer; a creative student may see his future in advertising. You can help show our students the bigger picture. ​All volunteer hours will count towards your Marian Fund!